The doorman walked ahead of me, up the red carpeted staircase, to the grand suite of Castlemartyr Resort. I was pleasantly surprised to learn that we had been upgraded from the standard room to one of the most luxurious. Here, I could truly experience what it would be like to live as Lady of the Manor. Castlemartyr Resort is an 18th century classic manor house that lies adjacent to the ruins of an 800-year-old castle built by the Knights Templar. Today, it has been flawlessly renovated as a five-star luxury resort (one of the best in Europe). It is nestled on 220 acres of mature landscape, with meandering streams, a tranquil lake and parklands abundant with wildlife and gardens, including a reconstruction of the historical, classical parterre beds. As the doorman showed me around the suite, I gazed down at the parterre beds. The window offered a panoramic view of the gardens, lake and meadows. As I admired my golden bedroom, I quickly decided that I would like one similar to it at home. There is simply nothing that quite compares to waking up feeling like royalty in the morning. In addition to a very generous bedroom, with an adjacent sitting room, there was an ample bathroom decorated in black marble, with heated floors, a separate rainforest shower, a full bath, a marble-topped vanity and a separate washroom. Down the hall, I found an additional bathroom for guests. As the doorman saw himself out, I collapsed on the bed in joy. Where to begin? 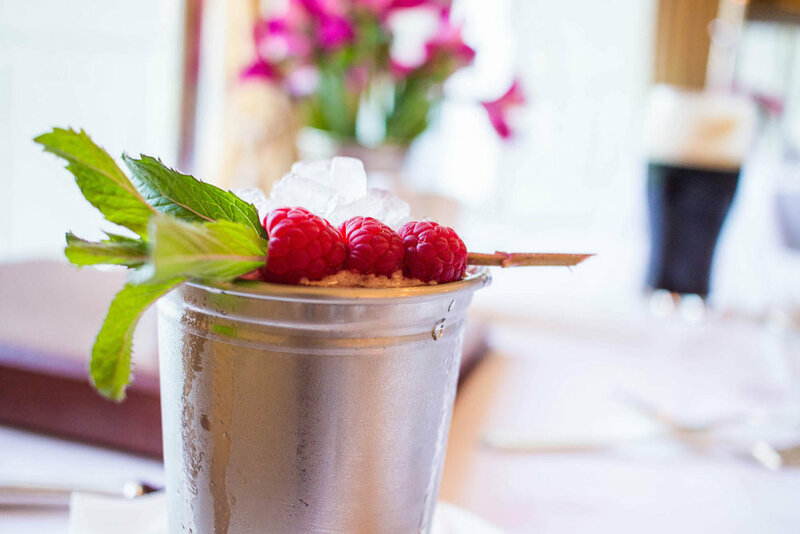 Castlemartyr Resort offers many high-end experiences for guests, including an 18-hole golf course, elegant dining at The Bell Tower, excellent craft cocktails at Knight’s Bar, classic afternoon tea and a luxurious spa. There were also numerous activities, such as carriage rides, horseback riding, fishing, archery, and laser clay pigeon shooting on the grounds. Since Luis and I had spent the day traversing around Cork and the surrounding sites (Blarney Stone and Cork City), we were tired and our room was calling for us to relax for the night. I took a moment to unwind as I dressed for dinner. Castlemartyr Resort is steeped in Emerald Isle history and tradition. The castle, from which the village of Castlemartyr takes its name, was built in 1210 by the Knights Templar, who were one of the most famous of the Christian military orders under the leadership of Richard Earl de Clare, more commonly known as Strongbow. In the centuries that followed, the lands changed hands many times—among its owners were Sir Walter Raleigh and Richard Boyle, the first Earl of Cork. It was under Boyle's stewardship that the construction of the magnificent Manor House took place in the 17th century. Painstakingly restored to its original grandeur, the Manor House now forms the centerpiece of Castlemartyr Resort. I walked down the stairs of the Manor House and headed to dinner at The Bell Tower restaurant; then to Knight’s Bar for cocktails. The quality of the cuisine and drinks was unprecedented. As someone who has stayed in several resorts of this caliber, I was very impressed. To learn more about that experience read our article here. In addition to the quality of the cuisine, the part that impressed me the most about Castlemartyr was its staff. The maître d didn’t simply seat us and disappear. He was there to guide our palate on a flavorful journey; asking which tastes we enjoyed most, then creating a custom dining experience. The bartender at Knight’s didn’t simply make our drinks—he served from a menu he personally designed during a six month period of testing cocktails and altering recipes. And the front desk didn’t simply dismiss us when we checked out of the hotel—they offered to drive 40 minutes to our destination on finding we forgot one of our bags. Castlemartyr Resort is more than a hotel—it is a luxury destination and experience. We were guests of Castlemartyr Resort, however, the opinions are our own. Room prices vary depending on the time of year. To learn more about the resort visit www.castlemartyrresort.ie.